A standing order is a collection of products and/or services which are regularly ordered by a customer. This allows an order to be quickly created from the standing order with minor modifications included depending on the customer’s requirements on the day. A standing order can be modified at any time. Use Find (F2) to locate the customer code. Press Enter. Enter product lines. Use Find (F2) to locate the Product codes. Choose Finish (Esc) and Accept (F9) to complete the standing order. To generate orders from Standing Orders, first select the ranges you require. You can select Standing Orders by Standing Order Number Range, Customer Range, Date Range, etc. If you want to combine more than one Standing Order for the same customer into a single order, you can select Combine Standing Orders. Update Customer Details checkbox – To use the customer address and delivery address from the masterfile, select this check box. You can choose whether you wish to print an order confirmation. You can also choose to print an Exception Report (recommended) which advises if, for example, a customer has reached their credit limit, their account is in dispute or a backorder is created. If you choose to print an Exception Report, you can page down to select your output device. 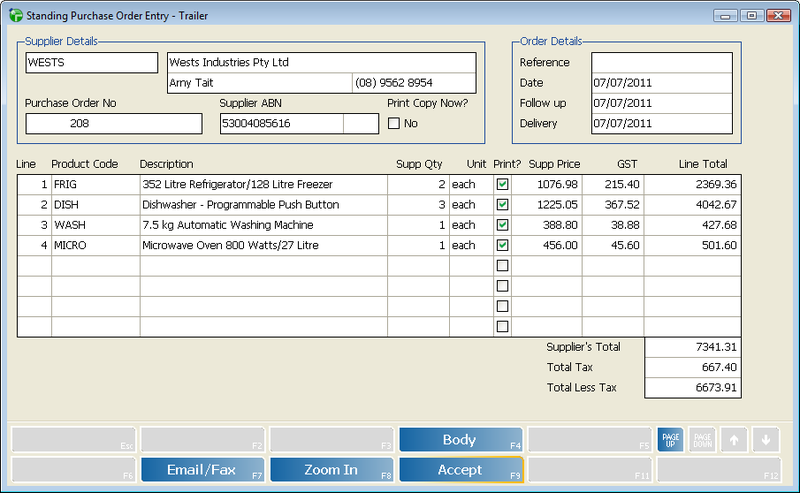 To generate the orders manually, choose Manual in the Manual/Auto field. Otherwise, choose Auto for automatic generation. When you finish selecting the required ranges and parameters, choose Accept (F9) to generate the orders. If you chose Auto in the Manual/Auto field, all Standing Orders which meet the selection criteria are generated into orders or backorders. If you chose Manual in the Manual/Auto field, all Standing Orders which meet the selection criteria are added to a batch of temporary orders. You can view the orders one by one, edit an order as you normally would and choose to include or exclude an order from the batch. 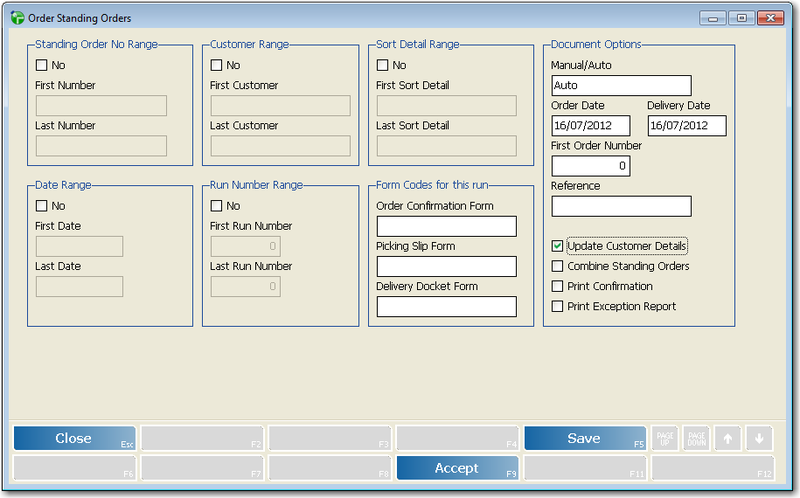 Select Accept (F9) to create the order or Delete (F6) to remove it from the batch. 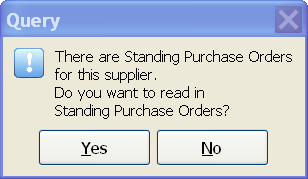 Create Standing Order is used to enter details of any orders you place with a supplier on a regular basis. 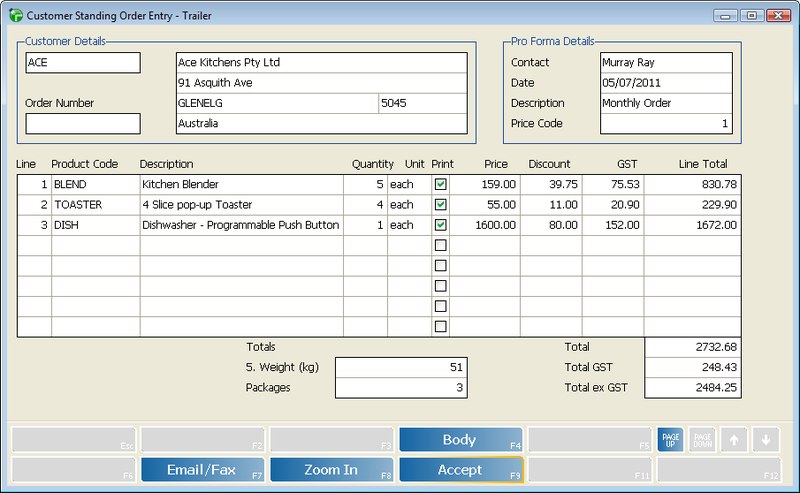 This program will also allow you to modify existing Standing Purchase Orders. During Purchase Order Entry, the system will check and display a popup for those suppliers with standing purchase orders. You can read in as many Standing Purchase Orders for a supplier or you can select to read in individual lines instead of the whole order. The line details are the only details read into a Purchase Order from the Standing Purchase Order. Header and other trailer details will be as entered on the Purchase Order itself.